The image below represents the CEOS organizational structure, including primary and secondary paths by which each entity reports to leadership. The CEOS Governing Documents provide more detailed information about the CEOS Organization and these various entities. An acronym list can be found at the end of this section. The CEOS Chair is a senior space agency official that serves a one-year term as the primary interface for all external coordination. The Chair reports to CEOS Agency Principals at the annual CEOS Plenary session and ensures that their guidance and direction are appropriately reflected in CEOS activities and priorities. The CEOS Chair presides over the CEOS Secretariat (SEC), the CEOS Executive Officer (CEO), the Deputy CEO (if one exists), and the CEOS Working Groups. The Chair also presides over the Troika, which consists of three entities: the Chair him/herself, the future CEOS Chair, and the past CEOS Chair. The Troika is a leadership mechanism the Chair can use to discuss important topics. Other entities, such as the SIT Chair, CEO, and SEO are sometimes invited to participate in Troika meetings. The CEOS Chair Terms of Reference provide detailed information about Chair responsibilities. The SIT Chair serves a two-year term and formally reports to the CEOS Chair. The objectives of the SIT Chair focus on strategic guidance with regard to governance, stakeholders, and the accomplishment of Virtual Constellation and Working Group deliverables. 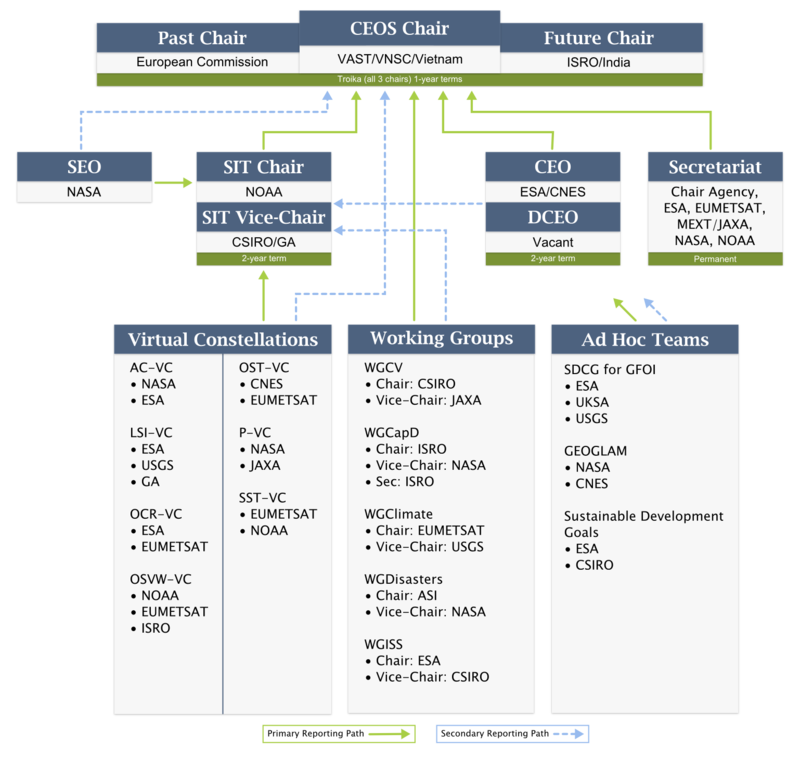 In addition, the SIT Chair coordinates the technical implementation of CEOS contributions to the Group on Earth Observations (GEO) Work Plan (as delegated by the CEOS Chair). The SIT Chair also facilitates structured debate on strategically significant issues during SIT Meetings throughout the year. The SIT Chair Terms of Reference provide detailed information about SIT Chair responsibilities. The SEC coordinates internal and external CEOS activities between Plenary sessions and assists the CEOS Chair and SIT Chair in the formulation of CEOS position statements, the coordination of external meeting attendance, and the review of major meeting agendas, actions, and minutes. In addition, SEC Agencies maintain the Earth Observation Handbook & Database and publish several CEOS outreach publications. The SEC also allows participants the opportunity to report on other relevant topics. The SEC Terms of Reference provide detailed information about the role of the SEC. The CEO Terms of Reference provide detailed information on the role of the CEO. The SEO formally reports to the SIT Chair, but also considers requests for work from the CEOS Chair. The SEO provides systems engineering leadership to the Virtual Constellations, Working Groups, and other ad hoc CEOS activities. The SEO facilitates the use of systems engineering methodologies and tools to strengthen plans and improve CEOS collaboration. The SEO Terms of Reference provide more detailed information on SEO activities. The CEOS Working Groups are one of two permanent, working-level mechanisms that coordinate CEOS Agency assets. They report primarily to the CEOS Chair and typically address topics such as calibration/validation, data portals, capacity building, disaster management, climate, and common data processing standards shared across a wide range of Earth observation domains. Working Group activities are connected with and complementary to the work of the Virtual Constellations. The Working Groups’ Terms of Reference provide more detailed information about individual Working Group activities. The CEOS Virtual Constellations are the other permanent working-level mechanism for coordinating CEOS Agency assets. Virtual Constellations report primarily to the SIT Chair and are typically made up of space-based, ground-based, and/or data delivery systems that are coordinated to meet a common set of requirements within a specific domain. Virtual Constellations make use of collaborative partnerships to address observational gaps, sustain the routine collection of critical observations, and minimize duplication/overlaps while maintaining the independence of individual Agency contributions. The Virtual Constellations’ Governing Documents provide more detailed information about individual Virtual Constellation activities. CEOS has the ability to create CEOS Ad Hoc Teams in the event that the permanent mechanisms described above are insufficient for CEOS to undertake a particular activity. When creating an Ad Hoc Team, the Plenary assigns short-term objectives to the team and defines its lifetime. An Ad Hoc Team reports to either the CEOS Chair or SIT Chair, depending on its purpose and function.